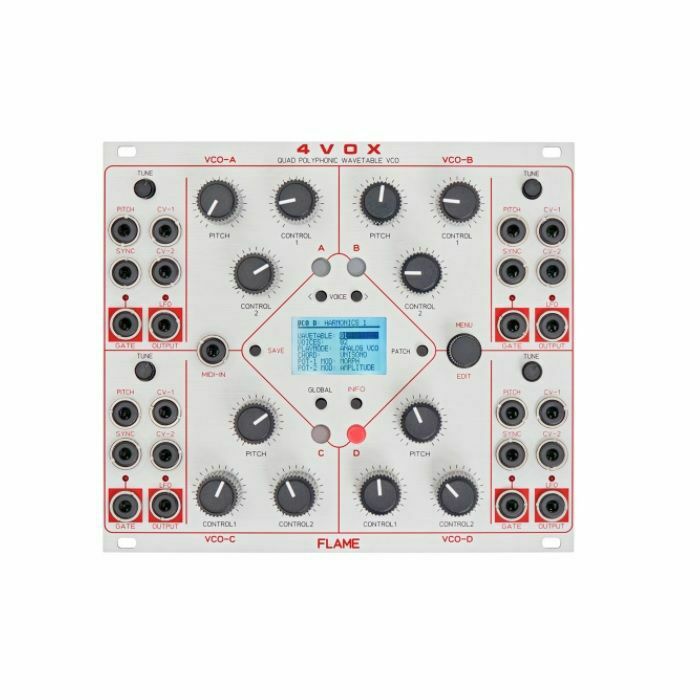 FLAME Flame 4 Vox Quad Wavetable Oscillator Module vinyl at Juno Records. The 4Vox is a quad wavetable oscillator with up to four voices per VCO, resulting in a maximum of 16 voices at four individual outputs. With the MIDI In, the module can be played both with CVs and directly via MIDI, which also allows for modulating some additional parameters. There are 39 memory locations for wavetables and 32 for all global parameters of the VCOs. The parameters of a wavetable can be controlled by CVs and by MIDI. For instance, you can morph through a wavetable with a CV, a MIDI controller or manually with the potentiometer. The range of waves within a wavetable can be selected by minimum and maximum values individually per voice which allows for creating more complex morphs. Further controllable parameters are Detune, Semitone, Octave, Chord, Portamento, Amplitude and Amp Move (90 degrees phase shifted volume modulation of a VCO's 4 voices). Min and max values can be selected for those parameters as well. Via MIDI it's possible to control further parameters (notes, chords, pitch bend, patch selection and wavetable selection). The VCOs can be played analogue (frequency by Pitch CV input), monophonic via MIDI or 4-voice polyphonic via MIDI. The VCO can be used as a voltage controllable LFO with 3 modes: loop, one shot and gates. The SYNC input is used to trigger/reset the LFO. In one shot mode the LFO can be used as a trigger delay, too (SYNC = trigger in, GATE = trigger output, PITCH = delay time). The display can show a graphic of the selected waveforms. All global parameters and also the VCO's settings can be named and saved as a non-volatile patch by the user. 32 memory locations are available.